SEOUL/TOKYO, Oct. 30 (Yonhap) — The Supreme Court on Tuesday ordered a Japanese steelmaker to compensate four South Koreans for wartime forced labor and unpaid work, casting a cloud over already soured ties between the two neighbors. The top court upheld an appeals court ruling in 2013, which ordered Nippon Steel & Sumitomo Metal Corp. (NSSM) to pay each plaintiff 100 million won (US$87,720) in compensation. Only one of the four victims who started the lawsuit remains alive. The elderly men lodged a damages suit against the Japanese firm in Korea in 2005 after they lost a similar litigation in Japan. The highest court in Osaka ruled that NSSM, a company created by a merger between Nippon Steel and Sumitomo Metal Industries in 2012, is not obliged to take on financial liabilities of its former company. South Korean courts also dismissed their claims. But in a landmark ruling in May 2012, the top court quashed the lower courts’ decisions and ordered a retrial. 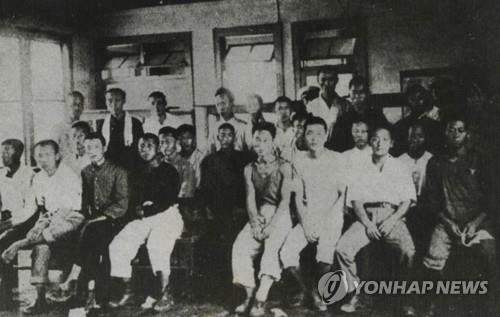 The court found that the Japanese court’s decision was based on the disputable premise that its 1910-45 colonial rule of Korea was legal, which is contrary to the South Korean Constitution. It found that NSSM has the legal responsibility for the damages because part of its foundation is Japan Iron & Steel Co., the predecessor of Nippon Steel, and the two entities should be considered identical. It also ruled that the 1965 bilateral treaty signed between South Korea and Japan to settle colonial-era issues does not terminate individuals’ rights to claim damages. The Japanese government and firms accused of harsh labor have claimed Japan’s provision of US$500 million to Korea as part of the deal was in exchange for a complete and final settlement. But Seoul has argued the deal does not cover all issues, including Japan’s wartime sexual enslavement of Korean women. In Tuesday’s ruling, the top court retained these adjudications. The South Korean government reacted cautiously to the verdict. “The government plans to issue its position on the Supreme Court’s ruling through a meeting of related ministers, chaired by the prime minister,” Noh Kyu-duk, spokesman for the Ministry of Foreign Affairs, said at a press briefing. He also said it’s important for both sides to make efforts to limit the negative impact of the ruling on bilateral relations. He reaffirmed Japan’s position that the compensation issue was fully settled in the 1965 bilateral accord on normalizing the countries’ diplomatic ties. He warned that his administration is considering “every option” as well, including taking the case to an international court. 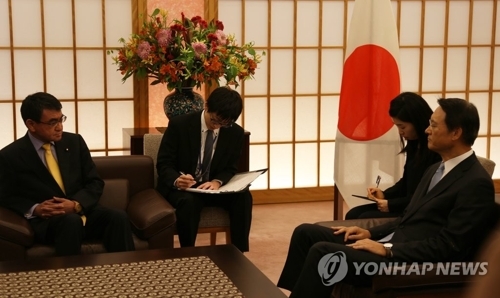 Kono summoned Seoul’s top envoy in Tokyo, Lee Su-hoon, to lodge a protest. He started the 15-minute meeting with the ambassador without offering a handshake. The minister stressed that the Seoul court’s ruling clearly violates the existing agreement that has “fully and finally” settled related legal issues. Following the meeting, Lee told reporters that he had listened to the Japanese government’s position and adequately explained Seoul’s view. This case has lately become a hot-button issue in Korea following allegations that a former top court chief justice used the case as political leverage to lobby the office of the previous President Park Geun-hye, who wanted amicable relations with Tokyo, to achieve his personal ambitions. Victims’ families and civic groups have strongly denounced the top court’s alleged power abuse and called for swift progress amid a fast decline in the number of surviving forced labor victims. Recent government data show that the number of survivors dropped 19 percent to 6,570 as of October compared with two years ago. Of the four plaintiffs in Tuesday’s suit, Lee, 94, is the only surviving victim. Lee, in a wheelchair, appeared at the courthouse earlier in the day to hear the ruling. “There used to be four of us, and I am sad to be alone now. I can’t help crying,” he sobbed. According to court data, 13 other similar cases pertaining to forced labor are pending at courts across the country, including two at the top court.